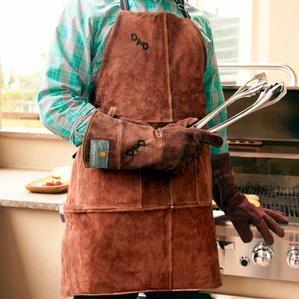 Grill in style with this heavy-duty leather apron and matching gloves! This comfortable apron, featuring a soft suede finish on the front along with several handy pockets, will protect you and your clothing from the perilous spills that come with outdoor cooking. Its soft cotton lining and adjustable straps provide a super comfortable fit. Custom branded with your initials, it's the perfect gift for the cook who has everything! Protect your hands and wrists from the intense heat of the grill as well - these matching leather grilling gloves feature a soft suede finish and measure a lengthy sixteen inches to protect even more. A comfortable fit with improved dexterity allows each wearer to wield any grilling tool with ease. 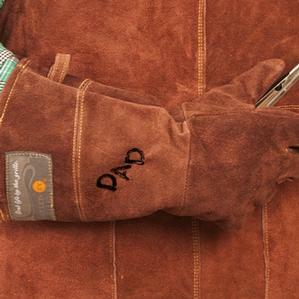 The right hand glove is custom branded to match your apron. The perfect gift for the dedicated grill master! 1. How do I care for my Personalized Gloves/Apron? 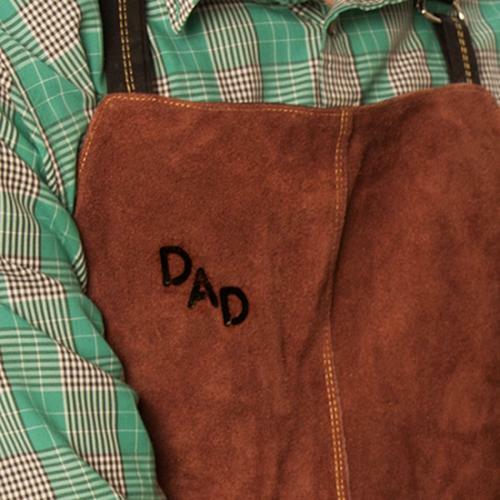 To keep your leather gloves/apron clean, remove small, dry stains by rubbing gently with a clean pencil eraser. Small stains that are still wet should be blotted up by putting a paper towel on it. If needed, treat larger stains with a vinegar-dampened cloth. Do not wring out your gloves/aprons as this will misshapen them. 2. How big are the gloves? With a generous 16" length our gloves are one size fits all to provide you with even more protection while you cook. 3. What size are the Aprons? Our aprons measure 30" in length and 20" wide to keep you comfortable and fully protected from whatever messes grilling throws your way!